So you know how the world sometimes makes you wanna sink deep deep deep deep deep deep deep deep deep into a watery grave?? This book helps me not do that! To Persians, the poems of Hafiz are not “classical literature” from a remote past but cherished wisdom from a dear and intimate friend that continues to be quoted in daily life. With uncanny insight, Hafiz captures the many forms and stages of love. His poetry outlines the stages of the mystic's “path of love”—a journey in which love dissolves personal boundaries and limitations to join larger processes of growth and transformation. With this stunning collection, Ladinsky has succeeded brilliantly in translating the essence of one of Islam’s greatest poetic and spiritual voices. Daniel Ladinsky is an acclaimed poet and translator of mystical poetry. For six years, he made his home in a spiritual community in western India, where he worked and lived with the intimate disciples and family of Avatar Meher Baba. 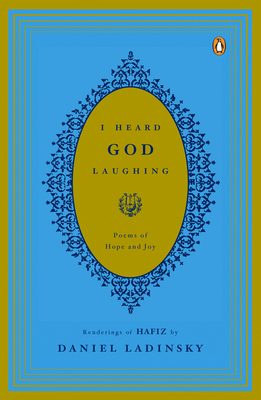 This is his fourth volume of Hafiz poetry in translation. His other books include Darling, I Love You!, The Gift, The Purity of Desire, A Year with Hafiz, and The Subject Tonight is Love, as well as a collection of translations of poems by twelve mystics and saints, Love Poems from God.